Five down, two to go! 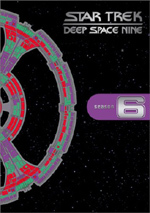 With this DVD release of Star Trek: Deep Space Nine, we can see the light at the end of the tunnel. This set gives us Season Six of the series, so only one season remains after this one. These shows will be discussed in the order broadcast, which is also the way in which they appear on the DVDs. We pick up right where Season Five ended with A Time to Stand. The Dominion War finally begun, Starfleet leaves DS9 to their cause. We see most of our personnel on the Defiant as they await Starfleet orders and hear of terrible losses suffered in battle. When Captain Sisko (Avery Brooks) gets his new command, he finds he and his crew will infiltrate Dominion territory to destroy the source of sustenance for the Jem’Hadar, the Dominion’s enforcers. In the meantime, the joint Dominion/Cardassian occupation of DS9 continues, as they attempt to work with Major Kira Nerys (Nana Visitor) and the Bajorans. Kira strongly suspects that Cardassian leader Gul Dukat (Marc Alaimo) wants nothing other than revenge against the Bajorans. The baddies also try to clear the minefield the Federation left in the wormhole. After the heat of the Season Five-ending episode, “Stand” feels a little like a “place-holder”. It shows the development of the war but lacks the drama and excitement we might have expected. It’s an interesting show, and it ends on an intriguing note, but it doesn’t launch Season Six with much of a bang. Events from “Stand” continue in Rocks and Shoals. After a fight with the Jem’Hadar, Sisko and crew crash on a barren planet. As it happens, some Jem’Hadar wound up stranded there as well. The two groups bump into each other when Nog (Aron Eisenberg) and Garak (Andrew Robinson) get captured on a patrol. A rough truce comes into play since the Vorta leader is injured and needs access to Dr. Bashir (Alexander Siddig). Back on DS9, Kira has to cope with Bajoran protests and some feelings she may be in collusion with them. Though the theme connected to Sisko and the Jem’Hadar dominates “Rocks”, it’s the Kira subplot that provides the most intriguing moments. It gets only a little play but gives us some depth and intricacy. The other parts seem more like the standard “sleeping with the enemy” we’ve seen previously. A few elements complicate this, but those remain only moderately compelling. Matters complicate for Worf (Michael Dorn) during Sons and Daughters when his kid Alexander (Marc Worden) ends up serving on a Klingon ship with him. The boy regards Worf with obvious disdain, and tensions exist between them. It doesn’t help that the other Klingons don’t much care for the Earth-raised Alexander. Meanwhile, Kira, Odo (Rene Auberjonois) and Sisko’s son Jake (Cirroc Lofton) attempt to launch resistance against the occupying powers. This complicates somewhat when Dukat’s half-Bajoran daughter – and Kira’s friend - Ziyal (Melanie Smith) returns to DS9. Sometimes it feels like Trek writers come up with a theme for a show and try to adapt the story to fit that idea. “Sons” falls into that category. The dual stories of Alexander and Ziyal feel forced – especially in the case of the former. It’s like someone sat in a meeting and thought, “Didn’t Worf used to have a son?” “Sons” seems anti-climactic and without much import. Starfleet discovers a powerful Dominion sensor array in Behind the Lines, and they plan to send Sisko and the Defiant to destroy it. However, when he gets a promotion to second in command at a space station, Dax (Terry Farrell) gets to pilot the Defiant while Ben stays back at the station. He finds it tough to deal with the concept of being away from his ship and crew. On DS9, some of Kira’s resistance actions lead to increased tension between the Cardassians and the Jem’Hadar. Odo’s situation complicates when the leader of the Founders comes to visit him. “Lines” offers a moderately scattered program, but it pursues some intriguing elements. After the bland “Sons”, it’s good to see the Dominion story furthered, and while nothing terribly earth-shaking shows up here, at least it moves matters along nicely, especially in a detour Odo takes. The troops start to feel disheartened by Starfleet’s nibbling engagement tactic with the Dominion, so in Favor the Bold, Sisko proposes that they stage a mission to retake DS9, and his bosses agree. 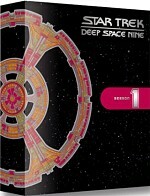 Back on DS9, Odo remains closely tied to the Dominion leader, which makes him no help to Kira and the others as they attempt to free Rom (Max Grodenchik) and prevent the joint Cardassian/Dominion force from disabling all the mines laid in the wormhole; without those, Jem’Hadar reinforcements will pour in from the Gamma Quadrant. One of my frustrations with DS9 stems from the fact it seems to present more episodes in which people talk about and plan for what will happen than actually show what happens. Some of this is necessary, but the series seems to go overboard with set-up and exposition. “Bold” falls into that category, as it stands as a placeholder episode. It preps us for a grand battle that presumably will come in the next program. Assuming that happens, it works fine in that slot. All I know is I’ll be cheesed if we don’t find a good resolution for this plot in the next show. We move toward the second part of that tale in Sacrifice of Angels. Sisko leads a massive assault on DS9. While that occurs, Kira and company attempt to aide them from within. “Sacrifice” presents a disappointing climax at best. To be sure, it includes some exciting moments, and it’s good to finally see something happen. However, it still presents too many talky bits, and the deus ex machina that finally allows Starfleet to reclaim DS9 seems cheesy. After the major battle in the prior show, character matters take the forefront in You Are Cordially Invited. Dax and Worf accelerate their wedding plans so that the recently transferred Alexander can attend. Worf invites his male buddies to indulge in a four-day-long “Klingon bachelor party” called Kal’Hyah; unsurprisingly, this is significantly less fun than the humans hoped. In the meantime, General Martok’s (JG Hertzler) wife Sirella (Shannon Cochran) puts Dax under the microscope, as the Trill officer needs her approval before the ceremony can proceed. Since Sirella opposes the marriage, that becomes an obstacle. I must admit I grew somewhat tired of explorations of Klingon ceremonies back during Worf’s Next Generation days, so parts of “Invited” seem tedious to me. Nothing terribly innovative or creative shows up here, as it’s pretty much the usual seriousness and deprivation. Nonetheless, “Invited” offers some moments of levity, mostly because the various enterprises are so miserable. It’s also good to finally see Word and Dax get married; at least now we don’t have to listen to them plan the wedding any more. A visitor from the alternate universe occasionally seen arrives on DS9 in Resurrection. This causes some issues for Kira since he’s the doppelganger for her old love Bareil (Philip Anglim). A thief and a shifty customer, he doesn’t want to head back to his existence, and unsurprisingly, Kira starts to fall for him. Usually an episode like “Resurrection” would balance the main plot with a secondary storyline. Unfortunately, that doesn’t occur here. The Kira/Bareil tale is all we get, and it’s not very interesting. Mostly it simply plods along toward its fairly inevitable conclusion. In Season Five, we learned of Bashir’s genetic enhancements. We meet some others with his status in Statistical Probabilities. Isolated at a Starfleet Institute, they display many emotional issues highlighted by the paranoid and manic Jack. They seem to prove useful when they display insights into the situation with the Cardassians and the Dominion when that group indicates an interest in discussions for peace. A problem occurs when their long-range interpretation indicates that there’s no way the Federation can beat the Dominion. At first I assumed “Probabilities” would be a pointless diversion from the war at hand. Instead, it provides a surprisingly intriguing look at Bashir’s status, as it’s very cool to see others of his kind. In addition, it furthers the Dominion plot and actually moves it along better than some programs supposedly devoted to the topic. Despite some overacting from Siddig and a few guest actors, “Probabilities” offers a compelling tale. The Dominion captures Quark’s (Armin Shimerman) mother (Cecily Adams) in The Magnificent Ferengi. The Grand Nagus sends Quark to rescue her, and he recruits brother Rom to help. They set up a posse to assist in this Enterprise as they attempt to deal with the Dominion and retrieve Moogie. Quark and company usually make for good comic relief, and “Magnificent” provides a fairly entertaining take. It’s fun to see them attempt to be warriors and to have to work their way through the various complications. The show presents a clever little enterprise. After events seemed to drive him to the brink of madness, Gul Dukat appears to recover in Waltz. As Sisko chats with him about his impending fate, the ship takes an attack. The survivors go missing, so personnel from DS9 head out to find them. In the meantime, an injured Sisko ends up stranded with Dukat, which leaves the captain in the hands of his one-time enemy, a factor compounded by the Cardassian’s erratic mental state. While a decent episode on its own, “Waltz” suffers from a certain sense of “been there, done that”. Trek often likes to put enemies together in desperate situations, so this feels like the sort of show we’ve seen in the past. Dukat’s nuttiness gives it a moderately different twist, but not enough to make the program terribly memorable. At the start of Who Mourns For Morn?, Quark’s favorite barfly bites the dust. He leaves Quark his entire estate, and that apparently includes 1000 bars of gold-pressed latinum. Unfortunately for Quark, Morn dealt with some shady customers, and they all come calling for the treasure. “Morn” includes few surprises, but it manages to present an entertaining program nonetheless. From the very start, it seems clear what kind of path it’ll take, and little veers into genuinely unexpected directions. Still, it’s a fun little piece. The pressures of war start to get to Sisko in Far Beyond the Stars. He skips in and out of present time and ultimately finds himself back in 1950s America, where he learns he’s a staff member on a science-fiction magazine. His colleagues look an awful lot like the staff of DS9. Sisko writes a story that involves the crew and setting of DS9, but he encounters the realities of the era’s racism, which means he finds it tough to get them to run the tale unless he makes the captain white. A runabout manned by Dax, Bashir and O’Brien heads into a scientific anomaly that will shrink them in One Little Ship. Tethered to the Defiant via a tractor beam, the connection gets snapped when the Jem’Hadar attack and take over the main ship. When the runabout gets back to the Defiant, they don’t return to normal size. The crew tries to rectify this via excursions inside the Defiant, which connects with attempts to get rid of the Jem’Hadar forces that took control of the vessel. Without question, “Ship” goes for a gimmicky approach to its subject. The tiny vehicle motif is intriguing but not much more than that. There never seems to be much behind the episode other than its Fantastic Voyage viewpoint. Its most interesting element stems from a new concept: the Dominion bred “Alpha Jem’Hadar” intended for combat in that sector, and they contrast against the Gamma Jem’Hadar. O’Brien goes undercover as a shifty repairman in Honor Among Thieves. He infiltrates a criminal organization called the Orion Syndicate so he can find out the identity of a Starfleet informant in the crew. Matters complicate when he gets close to one of Bilby, one of the crime bosses, which makes him question his allegiances. This kind of story can only work for O’Brien, as he’s the most down-to-earth and loyal DS9 character. That doesn’t make it a particular compelling tale, though. Because the Dominion gets involved with the baddies, it does slightly further that storyline, but it generally feels wan and predictable. Worf and Dax go off to meet a Cardassian operative in Change of Heart. In exchange for his information, Lasaran demands that the pair immediately remove him from Cardassia. This proves complicated. In the meantime, O’Brien obsesses over Tongo in an attempt to learn enough to beat the seemingly invincible Quark. “Heart” lets us focus on the Dax/Worf relationship to a degree, and it also indicates that Bashir never really got over his crush on Jadzia. It totally skimps on plot because it really exists for only one reason: to communicate the bond between the pair. That makes it an important episode but not a terribly interesting one.